Remnant ROCOR: "Our Church is small but pure as crystal"
"Our Church is small but pure as crystal." The first printing of this quote I am aware of is 1997, Jordanville, in a commentary made by monk Vsevolod Filipiev (who eventually went with the ROCOR-MP union).
" . 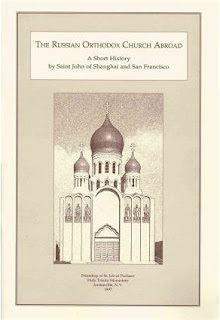 . . Amid the sorrows and deprivations which continually pursue the militant Church of Christ, let the words of prophesy spoken by our man of prayer Saint John of San Francisco comfort us: "Our Church is small but pure as crystal." Our Church is pure and holy not because of personal righteousness, which alas, we have not, but thanks to the treasure preserved without compromise within the heart of the Church,thanks to the Truth of Christ. . . ."
Monk Vsevolod calls it a prophesy, but I wonder, since the statement is in the present tense. It could just be St. John's observation. Prior to May 17, 2007, Unionite priests in ROCOR-MP were trained ahead of time how to handle it if anyone of their flock called attention to this quote. 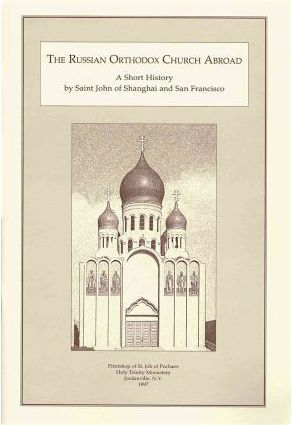 It turns out that monk Vsevolod is the only name that shows up anywhere in the booklet (after the commentary), so we assume he is also responsible for the rest of the book: translating St. John's history, writing the life and providing the timeline. Monk Vsevolod's translation is different from Fr. Seraphim's. Comparing the two translations I found two very short paragraphs inserted in monk Vsevolod's translation that are not in Fr. Seraphim's translation. The two paragraphs don't really flow well with the whole. But they are not unrelated. My guess is that the translator had a thought that he wanted to add, but it somehow did not get put in brackets as an "editor's comment" like it should have been. That the inserts were each separate paragraphs, and not hidden inside a paragraph, and that there is nothing tricky or sinister about either of them, points strongly to the explanation that these were editorial inserts that did not get properly marked. Anyway, one of the inserts starts with "In 1964..." and St. John wrote the article in 1960. So, Unionites used this discrepancy to prove that monk Vsevolod is a liar, saying none of the booklet can be trusted, and the deceitful anti-union monk just made it up about the "pure as crystal." What is extremely telling to me is that back in early 2007 when I mentioned the "pure as crystal" to my Unionite priest, he INSTANTLY had the answer. Without any hesitation he dismissed this evidence against the union saying some monk in Jordanville made it up. How was his answer so instant? unless he was warned in advance what to say? I caught this priest with instant canned answers to other questions also. And I think all the ROCOR priests were given instructions on how to answer these difficult questions in such a way as to end the discussion. Did monk Vsevolod make it up? 18. We were taught that our Church is “crystal” clear, like unto a glass of pure clean water. If pure water is mixed with dirty water, the pure water becomes murky. Will not the same thing happen to our Church if we enter into communion with the Church in Russia or with the Local Churches that are members of the WCC? It would be nice to verify the quote, if for any reason, then to right the slander against monk Vsevolod. Not that the fact would make any difference to anyone regarding the union. People have made up their minds. And the Unionites stubbornly stick their heads in the sand, not wanting to know the truth, or else pretending the truth does not matter. However, if the quote is a prophesy, if the prophesy is that ROCOR will be small (future tense), then that can be comforting for us in the very small ROCOR of today -- which seems to be evaporating in America. ROCOR will not disappear from the earth, because ROCOR is the guardian of the pearl -- the 3rd Rome. ROCOR will always exist until the ROC is resurrected by an Orthodox Tzar. And, St. John also said, repeating another prophesy that there will not be a 4th Rome. ". . . Yea, sacred are you, O Russia. The ancient writer was correct who said that you are the Third Rome, and there will be no fourth. . . ."